Ukrainian beauty brand Angel presents Lavender Handmade Natural Soap. It is designed to moisturise dry and problem skin. The product is formulated with lavender essential oil, calendula flowers, and celandine flowers. It is based on olive, coconut and palm oil, and infused with grapeseed oil. The soap is free of preservatives, animal fat, artificial colourants and fragrances. Key ingredients in this soap include medicinal herbs known for their anti-inflammatory and soothing properties. Calendula helps to unclog pores, stimulates skin regeneration, and helps to regulate the hydro-lipid balance. Celandine prevents hyperpigmentation, improves complexion, and helps to keep the skin healthy. The soap also contains lavender essential oil that relieves itchy and flaky skin, prevents redness, and produces a bactericidal, anti-inflammatory and regenerative effect. Grapeseed oil nourishes the skin, keeps it hydrated, makes the skin softer, and improves its elasticity. Ingredients. Saponified Vegetable Oils (Olea Europaea (Olive) Oil, Elaeis Guineensis (Palm) Oil, Cocos Nucifera (Coconut) Oil, Helianthus Annuus (Sunflower) Oil), Aqua, Vitis Vinifera (Grape) Seed Oil, Prunus Amygdalus (Almond) Oil, Lavandula Angustifolia (Lavender) Oil, Chelidonium Majus (Celandine), Calendula Officinalis. Want to buy Lavender Handmade Natural Soap? Call us or submit your order via our web site! 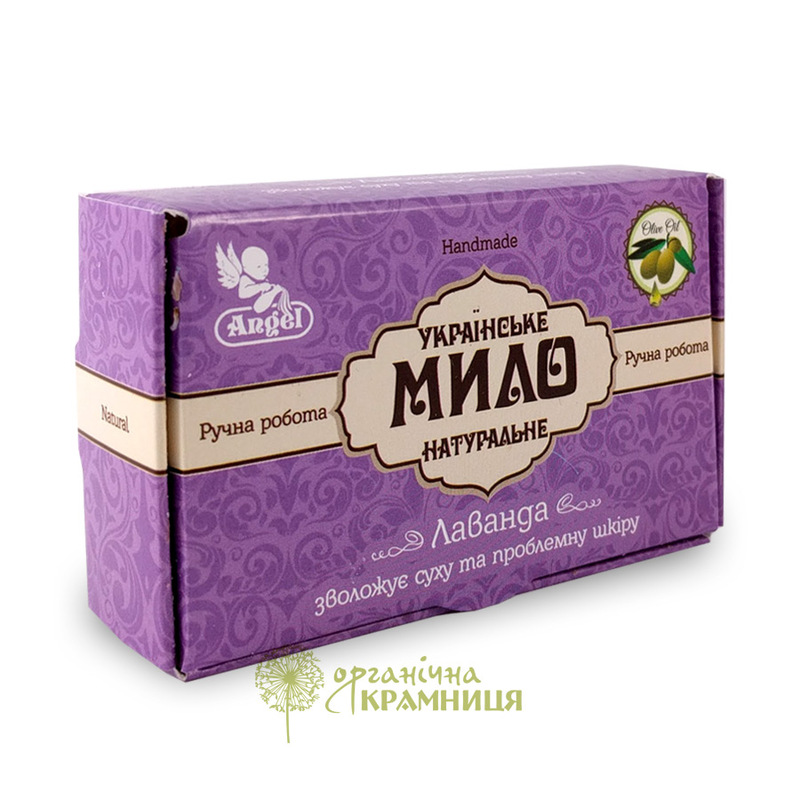 Ukrainian beauty brand Angel is primarily known for its natural soap based on vegetable and essential oils. The soap is 100% handmade, it is produced at the brand’s own factory located in the city of Vasylkiv in Kyiv Oblast (province). Any soap bar labelled as Angel is a high-quality product designed for the whole family. Angel has been producing handmade natural soap for more than five years. It offers consumers a rich and diverse selection of soaps, based on 100% natural ingredients. The brand’s products are free of animal fat, artificial colourants and fragrances, preservatives, and synthetic surfactants, such as SLS or SLES (sodium laryl/laureth sulfate). Angel soaps are based on saponified vegetable oils (olive oil, sunflower seed oil, palm oil, coconut oil), and enriched with essential oils and plant ingredients, such as herbal extracts and dried medicinal herbs. The entire production process undergoes thorough quality control at each stage, which ensures that Angel products are completely safe for human health and the environment. The brand offers soaps for all skin types, including delicate baby soap for overly sensitive skin and special soaps designed to combat common skin problems, such as eczema, psoriasis, acne, etc.